I really hate the evolution vs creationism stuff. It’s a completely unwinnable argument from any side of the equation. And I do like a good debate on the subject from time to time, but in reality the discussion of it seems to get people heated. People believe what they’re going to believe, regardless of whatever is presented. For myself, I’m pretty firmly on the side of evolution. It’s the biologist in me, and as much as I was raised a Catholic, I don’t really see the Bible as much more than another Creation myth. Not knocking anyone who does, but this is just me. Anyway, the only reason I even brought this up was because of this article over on ABC News. The title is a bit of a misnomer in itself: “New Fossil May Show How Apes Became Humans”. 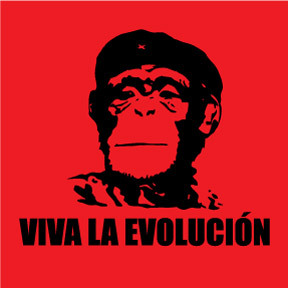 I find this irritating in the extreme, because evolutionary theory has never stated that man evolved from apes…but that we *both* evolved from a common ancestor. That we share 99% of our genome with chimps is pretty telling of *something*. Is the fossil in question said ancestor? Maybe. Maybe not. But I wish news organizations would get their damn stories straight. Of course, one only has to look at the comments beneath that article to see how passionately people can feel about the subject – and there’s a great deal of ignorance being thrown about, on both sides. It doesn’t lead to a very good discussion, I’m afraid, but that’s just the way it goes. 8 Responses to Creating my Evolution. When you're right, you're right. There are certain subjects you can't discuss with people because they will set out to make you change your mind. I'm a middle-ground person. On one hand, you can't dispute scientific fact, but on the other hand, I believe there's a higher power at work that may have guided evolution along. Who knows? Somewhere Pierre Boulle is shouting "see, zis ees what I deskribe in my novel, what you wretched Americans call 'Planet of Apes.'" Right. And I'm noy trying to denigrate anyone's beliefs at all. I'm an equal opportunity creation myth person. If you're going to recognize the Bible as truth, then you have to give equal weight to other religions' Creation stories as well, IMHO. But, yeah – I guess my beef with ABC is that it was just sensationalized and wrong. LOL. If you're going to give people something to argue about, at least get the facts straight. Of course, over-blown articles, like ABC's, ascribing "humanity" to bunches of bone that heat the arguments up. Faith and Science are two different human endeavors. Humans and homonids are two types of beings. Yeah. And it's why I don't really blog about stuff like that either. I'm bound to piss someone off, and I'm not really looking to get into an online flamewar over something like that. If everyone could just agree to disagree, that would be one thing – but a lot of people can't, once they get into the thick of it.